Darling National Demonstration Wind Farm in Cape Town, South Africa – Photo by Warrenski. Responding to climate change is one of the biggest challenges of our time, and the contributions of each and every person will be required towards the global effort of solving it. Sole reliance on public sector actors to find solutions would be misplaced, undermining the agency of other stakeholders like the private sector, labour unions, civil society and academia to respond. Attempting to bolster the involvement of the private sector in addressing climate change has been seen as one crucial enabler to the global effort. Key considerations for private sector actors, in developing bankable climate-related project proposals, are the design of financial models, and appropriate selection and use of financial instruments. A number of financial instruments are used by climate funds, and these vary in their complexity, application and structure. Financial instruments can support the de-risking of activities, including: revenue support, credit enhancement, direct investments, and insurance (Torvanger and Pillay, 2016). Examples of financial instruments used by large multilateral climate funds like the Green Climate Fund (GCF) include grants, concessional loans, equity and guarantees. The latter three instruments are of high interest to private sector actors given the assumptions made regarding the presence of revenue streams being generated by private sector projects. However, that being said, there is a strong argument to be made for the use of grants to act as an catalyst for certain investments (e.g. new market testing, breakthrough R&D, incubation and seed funding, etc.) – blended finance. However, in addition to the instrument’s purpose, the country context in which a particular instrument is used is of critical importance to effectively “blend” financial resources to address climate change. “Blended finance” is a term used to describe a form of public private partnership focusing on catalyzing long term private investment in a sector, using public and philanthropic funds to mobilise additional private capital. Research shows that only USD 2.9 billion (3.6%) of the private finance mobilised using blended finance flowed to Low Income Countries (LICs) between 2012 and 2015. Despite the lack of certainty around the use of complex financial instruments in the developing country context, and their contribution to financial flows to developing countries, there are increasing examples of financial instruments being used to mobilise climate funds. Loans offered on concessional terms essentially mean that the rates offered are more favorable than that available at the prevailing the market – for example the interest rates are lower or the payback period is longer. One example of the use of debt financing toward climate change outcomes was a recently approved USD 154 million GCF project to on-lend to independent power producers in Zambia. The Zambian AfDB GCF Renewable Energy Framework (FP080) seeks to support the Government of Zambia’s Renewable Energy Feed-in Tariff policy to develop 100 MW of renewable projects, mostly solar power, through long-tenor project loans. The project blends three instruments namely: USD 112.5 million in a loan (of which USD 50 million from GCF; USD 50 million from AfDB and USD 12.5 million from NAPSA / commercial banks / other investors), USD 37.5 million equity investment from project sponsors and a USD 4 million grant (of which USD 2.5 million from GCF and USD 1.5 million from AfDB). 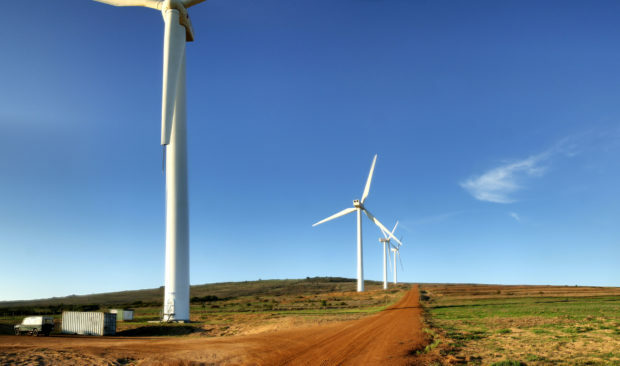 It is likely that the AfDB’s framework lending to finance renewable energy installations will continue to expand, noting that the AfDB’s entire 2017 energy investment portfolio was comprised of renewables. Equity describes an ownership stake within a project, company and/or economic asset offering returns to the investors through dividends during ownership, and/or capital growth on the asset upon sale. Investing in local, green, small and medium sized enterprises offers perhaps the most likely path to allow Southern African countries to meet their required growth trajectories, whilst embracing a net zero emissions future. Taking an ownership stake in small and growing businesses through an equity investment is one mechanism to support net zero emission entrepreneurs. However, the risk and transaction costs of placing these equity investments can be prohibitive unless they are bundled for investors with large amounts of capital to invest (e.g. institutional investors). The proposed Green Outcomes Fund in South Africa is one bundling mechanism that looks to incentivise existing financial intermediaries (especially private equity and venture capital firms) to consider taking on equity investments in enterprises that look to solve climate change whilst also returning a profit to their shareholders. Guarantees are risk reduction measures that make provisions, to ensure investors are paid out, should there be a default on a debt financing agreements (e.g. loans or bonds). This can be useful, for example, where investors are looking to provide climate finance instruments across borders: cross-border investments typically require one to account for the risks posed by potential fluctuations in exchange rates between countries. This is especially true if the investments are in fixed, long-lived infrastructure such as renewable energy installations. However, development finance institutions (DFIs), like Guarantco, can package credit guarantees that are used to secure long-term debt for infrastructure development, where the risk for foreign inward investment would otherwise have been too high for the private sector. Whilst insurance is typically not an instrument widely provided by multinational and bilateral climate finance, there is precedent for providing grant resources to explore the establishment of insurance-type mechanisms, where these have been shown pre-feasibility potential. For example, Namibia’s Environmental Investment Fund has proposed the piloting of a crop insurance and incentive scheme that would safeguard farmers in the crop-growing regions of the Kavango East, Kavango West and Zambezi within water-scarce Namibia. GCF Board approved the EIF’s CRAVE proposal in October 2016, and has disbursed 32.5% of the approved USD 9.5 million, with USD 0.5 million cofinancing from EIF. The establishment of national climate insurance mechanisms seeks to supplement continental efforts to build sovereign disaster risk insurance (e.g. African Risk Capacity) whilst providing avenues for local private sector stakeholders to invest in resilience. The DBSA has proposed the establishment of a Climate Finance Facility, which is seeking a USD 55 million loan from the GCF, to focus on infrastructure projects that mitigate or adapt to climate change. The Facility would on-lend subordinated debt / first-loss and credit enhancements (e.g. tenor extension) to projects that are commercially viable, but not currently receiving finance from private sector banks in local currency. Currently, the Facility is planning to operate within Lesotho, Namibia, Swaziland and South Africa. Another example is Africa GreenCo, which seeks to capitalise a creditworthy, independently-managed but government co-owned intermediary off-taker for cross-border renewable energy trading in the Southern African Power Pool. The concept was shortlisted through the GCF’s Pitch for the Planet request for proposals for Mobilising Funds at Scale, under the accreditation of the DBSA, with a no-objection letter from the Zambian National Designated Authority. Whilst neither of the abovementioned DBSA initiatives have GCF Board approval, both show promising use of instruments to advance climate finance at a regional scale in a manner that crowds-in private sector investment to solve climate change issues and contribute to enhanced contributions under the Paris Accord. In closing, enhancing the understanding of how best to utilise instruments to the advantage of Southern African countries is a necessary step towards enhancing ambition, expanding the use of instruments beyond grants and loans, and moving towards more strategic consideration and use of multilateral funds like the GCF. The above examples show that strategic use of instruments can allow the private sector to support an ambitious climate change response in the region.